What would I write now if I were to give an account of some stretch of nine formative years of my life in a paragraph, serving as the key markers of a short bio I’d then write—say, from my momentous move as a high school freshman, through my marriage and graduation from BYU (i.e., my entering of the promised land!)? I know that what I would write this year would be different from how I would’ve written it last year—and even more different than had I written it upon graduation. This isn’t just rhetoric—my extended family created a family history book published the year I graduated, and I wrote a two or three page biography for inclusion. I recently read it to my kids. I’m not at all unhappy with it, but I would not have written it the same way today. I can’t read Nephi anymore without reading a carefully crafted political narrative with lots of faithful spin (I don’t remember who first keyed me into seeing it this way). Discussing this with other saints sometimes makes them uncomfortable; but for me (and I think it should be the case for everyone), Nephi’s flaws (or at least, the flaws that my own reading of the text highlights) make the text more believable and certainly more useful. We have anything but a polished, perfect hero. We have a dedicated zealot, committed to a specific understanding of what his father’s experience and their family exodus meant, a narrative of himself as the rightful heir to that spiritual heritage, and a narrative that reveals that Nephi clearly felt threatened by contenders—whether those contenders were people (his brothers or the sons of Ishmael) or the competing narratives for what had happened (which other witnesses might tell). Nephi’s not writing this as a young man, remember; he’s writing this as an old “king” of a broken and exiled half-family in a strange land, experiencing a plethora of threats. He writes a forceful narrative to make it look like the Lord was with him all along and like his brothers were off all along. That’s how Nephi’s account reads to me, generally speaking. But while this oft-noted point about politics is conspicuous, I can’t think it’s merely politics. It’s certainly also identity. How much of this is identity in the making (writing in general, but particularly autobiography, is a powerful means of shaping identity; language in general is expressive and creational in this way) and how much of this is articulation of long-formed identity? The first line of the headnote is striking. It’s an account of Nephi’s parents and their four sons. Not of their household, not of the later sons and daughters born. (Were the daughters–mentioned in II Ne 5:6–later? We don’t know; they’re immaterial to Nephi’s account; which of course makes me wonder about his worldview more generally.) This is about the drama that took place between these six people as they organized and left Jerusalem. That’s clearly where the competing narratives originate, and that’s what Nephi focuses on. Each event he mentions (and then expands upon in I Nephi) is intentional in how it reflects well upon Nephi, poorly upon Laman & Lemuel, and marks Nephi as the God-chosen heir of Lehi’s heritage. Nephi notes their sufferings in the wilderness—not their suffering on account of being unprepared or on account of Lehi’s poor or hasty choices or on account of their having no real direction of what to do or where to go. And the book ends, not with their reaching land but with their reaching the Promised Land. Politics aside, is it possible today to genuinely experience my life as so profoundly enmeshed with the designs of deity? I let God off the hook all the time, citing bad luck, other people’s poor choices, genetic and personal weakness, and the like. Mostly, however, it doesn’t feel like choice. My own experiences seem so cosmologically insignificant. Is the difference because Nephi’s a megalomaniac, is he merely faithful in the wake of events far more dramatic than my own, or is this one of the ways in which culture transcends choice, with Nephi no more able to craft his experience than I am? Is one more faithful than the other? One final note on Grant Hardy’s provocative quote marks around “I, Nephi.” Reading chapter one in the wake of these quote marks, it’s conspicuous that our author never names himself as Nephi, but refers to himself as “I, Nephi.” I’ve always ignored this as a quirk—an odd, perhaps formal, but not ungrammatical way to refer to himself. But what if, as Hardy’s quote marks suggest, it’s more than that? What if it’s a title? Again, Nephi is writing this as an older king (or something close to that), and writing it to counteract other, competing narratives that are challenges to his theocratic authority. Was Nephi’s name changed when he became King? Like the Egyptian kings, did he receive a new name that shorthand referenced deity: ‘I am’ Nephi? 1. Again, I’m using Hardy’s A Readers Edition this time through, which is a wonderful new way for me to read the text. Not to be rude but your assumptions about Nephi are baseless and misinformed. You make it sound like Nephi was a self centered jerk. Are you active LDS? @Rob, you were in fact being rude, as well as misreading the offending sentence. Good trolling, mate. I’m not trolling. I’m here to talk about Nephi, or rather defend him it appears. Do you think Nephi was chosen over his brothers because of his loud deep authoritative voice, and could theoretically dunk way more basketballs than Laman or Lemuel? James, I’m not sure we can separate out identity from politics. Indeed most politics seems oriented around identity. Certainly I think it likely that Nephi’s account of his early days is biased by what came after. He’s apt to include the narratives where his brothers fail and perhaps leave out ones where they are much better. What gets left out (and of course we can’t know what gets left out) seems interesting. I’m not sure zealot is an accurate way to describe him though. I can understand why someone might say that. After all who else but a zealot would leave their riches behind to head out in the wilderness. But that might say as much about our identity and view of religion as it does Nephi’s self-identification. I think it fair to consider him an impressionable teen with a huge view of his father and wanting to live up to that criteria. But how much of what he presents is building himself up and how much building up his father? Both are present of course, but there’s often a strong humility and undermining of himself in his narrative. Notice how often he fails at first. When told to kill Laban he flinches and does it nearly under duress. Is that the narrative of a megalomaniac? He breaks his bow, nearly dooming the family. But in the narrative he’s always deferring to his father. Where he appears to be prideful is usually with a contrast to his brothers. I do think though we have to pay attention to the type settings into whose form he is casting his narrative. The exodus pattern is the most obvious one. In this case though who is Moses? Nephi or Lehi? There are other type settings patterning the narrative though. An obvious one is Joseph in Egypt with Laman and Lemuel taking the part of Joseph’s brothers. Isaiah’s types also are used within the narrative as well as within the midrash on Isaiah. Given the type settings, how much is he distorting (if at all) his narrative to fit it into these patterns? More importantly, how does the place of these place settings undermine the idea that Nephi is this prideful guy? That is how much of what you are reading is actually the product of the structures Nephi is reusing (as was likely the pattern of his education)? Clark: I feel like I owe you an upfront debt—thank you for taking these initial posts so seriously. I hope you stick around. I wonder if ‘zealot’ was an ill used word. I often think it’s hard to see Nephi as less than this. It’s not just that he does shocking things (you mention leaving their riches and land; murdering on account of one’s feeling that God wants you to is a better example; but goodness, we’ve not even made it to verse one yet). It’s also how hardline he is; uncompromising in the articulation of his narrative. That’s the Nephi of the text—I suspect the man himself was far less black and white. At least, he is when I fancy I hear him talking and explaining his text. I didn’t mean zealot in a merely derogatory sense; though I can’t hide from the fact that zealot’s a loaded term, particularly today. I certainly meant to draw the contrast with what we take as sensible, nuanced, more humble approaches today and Nephi’s account of himself. But my own rhetoric’s probably a bit much. We’re certainly in an era of identity politics, but I think you’re right—politics always includes issues of identity. My point wasn’t to bifurcate the two as a theoretic matter, but merely to think through the way Nephi’s experience seems so genuinely and completely an experience of God’s direct and continual intervention in his life. And to contrast this with my own experience, and wonder at the faith involved in either. It’s a great question: is Nephi lifting himself up or his father? I think the text certainly evidences a genuine love for and devotion to his father, but this doesn’t change the fact that everything in the text is also bent on justifying himself as the proper heir of his father’s spiritual and political authority. I think you’re right about the conspicuous aspect of self-justification with regard to his brothers. But again, if there’s a background of contending narratives (Nephi’s vs. “Laman’s”), this fact also colors Nephi’s treatment of is father. I could certainly be wrong on this score; but positing the competing narratives makes most sense of the text for me. Nephi later makes use of both the Moses and the Joseph narratives, casting himself in the role of both. The Headnote seems to me to encompass both. Fantastic point about the structures of Nephi’s education. From where I sit, it does smack of pride. But what if my education were more strongly that the lives of the prophets were general types of how each of our lives go with regard to the workings of God—and what if the holy texts were the overwhelmingly dominant literary resource of my life (forget being raised on Hollywood and local libraries!). Would Nephi’s contemporaries read him as culturally appropriate, even upstanding? Rob: fear not, I don’t think Nephi’s a megalomaniac, though it’s easy to read him that way. I rather like Nephi. In fact, I like him so much that (as noted in the series introduction), I’ve spent my entire life reading him, and have so far written more on him than on any other scriptural figure. But this isn’t a series to simply venerate him (although I can’t help but toss in my admiration throughout). It’s simply an articulation of my latest reading—and, I hope, a dialogue. The problem with the Laban narrative is that I think we read it too much from a contemporary perspective where even in the US with purported high crime rates we live in a very peaceful society compared to what Nephi likely faced. Nibley liked to tell that story of teaching Islamic students the story of Nephi and their problem was why Nephi waited so long, not why he did violence when a purported revelation came to him. So again, I think that question of how much our reading reflects our identity as much as Nephi’s is a live one. We have to be as suspicious of our own suppositions as we are of Nephi’s. If only to bring them into the open so we can discuss them in the bright light of day. Again I also think that Lehi = Jacob and Nephi = Joseph can’t be neglected. Note how Joseph has a vision, his brothers persecute him, and so forth. But also notice how Joseph’s dream has Jacob bowing down to Joseph whereas Nephi’s doesn’t have Lehi doing so. For Nephi his dream follows his father. So we have a break with type setting that seems very important. It’s interesting how the coat plays such an important role in both narratives as well. So I think Nephi is trying to justify his taking the mantel of his father but he does this in a very odd way. He didn’t appear to accept himself as the “king” of his people, but instead, their ruler. My question is, what exactly was the difference? I suspect Nephi is thinking of the difference between a King in Israel (that’s hereditary) and a Judge in Israel (prior to Saul). It’s interesting to consider how he presents his brothers, who would have been heirs, in light of that distinction. The verse you quote is interesting in light of Gen 37:5-10. And the “sought to take away my life” parallels 37:20. It’s also interesting, given Nephi presenting himself as a type of Joseph to read 2 Ne 3 where Lehi give a blessing to Joseph who is explicitly made a type of Joseph by Lehi. It’s kind of strange to have him make this Joseph comparison, and then launch into stuff that’s really not about Joseph per se. @Clark, RE the population, there is always the sticky issue of when and to what extent these interlopers engaged with existing native populations. Depending on their relative level of technology, Nephi’s band easily could have taken a leadership role with local tribes. Or the Lamanites did and thus their change in skin tone. But for whatever reason, non-Israelites and non-Jaredites just don’t merit inclusion in the narrative. A discussion about Nephi’s motivations and how much he massages his own narrative to fit the models presented by the Brass Plates (esp. of the chosen nation) probably has to grapple with this. If I understand correctly, biblical scholars see all sorts of foreign influences in the OT that later writers attempted to expunge. The racism of the Book of Mormon is interesting since it seems clearly presented as a failing by the Nephites. The old simplistic presentation of the Book of Mormon as good guys (white) versus bad guys (dark) is completely undermined by the actual narrative. Typically in the narrative the Laminates are far more righteous than the Nephites and the Nephites are quite unfair to the Laminates except for certain key figures like Ammon. Source criticism of the OT sees it has quite complex. So there was some redaction but I’m not sure you can simplify it as foreign influence. The interesting question for Nephi for source criticism is explaining how 2 Isaiah ended up in the Book of Mormon. It is stylistic quite different from the rest of Isaiah and typically is dated to post exilic. One can push the unity of Isaiah as some Jewish scholars do and Gileadi has done in a Mormon context. While possible, I confess I’m skeptical. The other possibility is that there was an other text contemporary with Lehi possibly separate from 1 Isaiah. After the exile references like Assyria or Cyrus were added and during the translation process Joseph largely followed the King James version or redacted and edited version rather than the version Lehi had. But who knows. It is true that the basic types, once you leave out explicit Assyrian references, seem much more general. And heaven knows the source criticism views are fine with later adding in explicit references. I personally have always seen Nephi as a hard working and faithful servant of the Lord who is wise beyond all his years and highly favored of the Lord because of his diligence in keeping the commandments and moving forth in faith. The dynamics of his family are interesting because on the one hand he has a great and astonishing ability to forgive his brothers and allow them to see God’s true power through Nephis great faith and humility, but on the other, these brothers would in time destroy his own seed and become the enemy. I never think we should take Nephi lightly or unduly speak of him as a zealot or megalomaniac even if we are just messing around. Nephi was a great and powerful prophet of God who was mighty in faith and diligence of the Lord’s errand. I feel it important that it is Nephi himself who later leaders and prophets perhaps patterned themselves after in the great Nephite civilization as the type to aspire to and live up to. He serves as the foundation upon which the Nephite record came to be. Looking at the Book of Mormon as strictly literature (all historical speculation aside), it appears that Nephi in 2 Nephi 5:21 was racist, for he clearly says that the Lamanites’ skin of blackness was a curse. Nephi prophesies in 2 Nephi 30:6 that many Lamanites will accept the gospel of Jesus Christ and consequently have the curse of black skin removed from them and become “white and delightsome.” LDS leaders in 1981 were clearly not comfortable with Nephi’s racist attitudes and changed “white” in the latter verse to “pure.” Of course, Mormon, in his abridgment of Nephite and Lamanite history in 3 Nephi, also clearly held to the belief that non-white skin was a curse, which was lifted from the Lamanites (3 Nephi 2:15) who “became converted unto the Lord” and joined the Nephites, but I guess that’s a matter for a different discussion. Nonetheless, there is no way around the fact that Nephi, as we know him through the text, had racial prejudices. Clark: Since I get to Laban later, I’m going to hold off on this for now. But I’ll say that I hope I’m being explicit about this being my reading of Nephi — and even more particularly my reading of Nephi this latest time through. I do a lot of imagining what it would’ve been like for an ancient world Nephi to be going through these events, but I’m just as interested in how the texts shows up today (where I am). I’ve already acknowledged that calling Nephi a “dedicated zealot” was a bit much; but my original image was a first century Jewish zealot, not a 21st century member of ISIS. I don’t find the difference between Nephi and Joseph you point to terribly compelling since the story is just as clearly criticizing Joseph as it is vindicating him. It would be odd for Nephi to adopt those facets, particularly if there’s a political motive to his writing, and especially if Lehi was a cherished figure amongst Nephi’s later audience. Brad L.: good question. It’s clear that the difference was important to Nephi. But he’s explicit from the beginning that he had a divine commission to be a “ruler and a teacher” over the family. And Jacob’s quite explicit about everyone after Nephi being a king. I like Clark’s distinction between king and judge. Rob: it’s nice that you acknowledge that you too are giving the text a specific reading or interpretation. There’s no way to make sense of a text without doing this. I personally don’t think the text itself supports such an unfailingly perfect Nephi. He appears to be much more comfortable and explicit with his failings than you are (his own claims aren’t anywhere near as strong as yours). This doesn’t make him less a prophet; it simply acknowledges that he’s also human. A first century Jewish zealot. I can see that. Might want to change his skin color then to brown while you’re at it too. I think that Nephi was autistic. He begins his narrative at the beginning of the reign of Zedekiah in 597 BCE immediately after the devastation of Judah by the Babylonians. Jerusalem was sacked and pillaged, the Temple looted, and the leading residents of Judah including its king were taken into captivity, and yet Nephi seems unaware of all of these catastrophic events around here. Perhaps he retreated into magical thinking in response to these traumatic circumstances and imagined events such as the encounter with Laban. Brad L, prior to this century nearly everyone was a racist. Even the great Abraham Lincoln has tons of statements we’d call virulently racist. And nearly all civilizations had strong xenophobic tendencies. Rome is a little different if only because they were conquering everyone. So of course Nephi’s xenophobic and racist. I do think we have to be careful on how we read those verses though. I still think a strong case can be made from the text on something more complicated than simply skin tone due to melanin levels. Further as others have noted, as a Hebrew prior to the move into northern Europe, his skin would have been fairly dark. Brian, I think it’s more complicated than that. If anything that might explain why some proto version of 2 Isaiah (Isaiah 48-52 quoted by Nephi/Jacob) is plausible since there’s already been destruction. I’d add that your criticisms would apply to a lot of Jeremiah too. I think it fair to note that the destruction Nephi and Lehi fears is the total devastation by Nebuchadnezzar II. The warned siege takes place 589 and the destruction in 587. To say Nephi/Lehi is ignorant of Nebuchadnezzar putting Zedekiah on the throne seems questionable. The whole reason the prophets are warning and calling for repentance is precisely because of Nebuchadnezzar and the threat due to there already being devastation. That Nephi doesn’t go into details on 597 and only talks about 587 seems reasonable, especially given the difference between the large and small plates. @Brian, were you just afraid to call him a “retard” because you know that’s not PC now? News flash: what you just wrote about people who live with autism is just as offensive. What you’ll notice about the entire BOM is that there are a lot of things the authors don’t mention because they don’t advance the purposes of the narrative. Given the focus of Nephi’s account, why would it be important to discuss the previous capture of the city? The first capture resulted only in the replacement of the king, while the second, later capture actually ended the Kingdom of Judah, destroyed the temple, and exiled much of the population. In terms of the grand arc of the narrative of the Chosen People, the second instance is the one that counts, which is why Nephi focuses on it. And why would you say the account of his confrontation with Laban is imagined? What about that story isn’t plausible? I really like the exercise you mention at the beginning. I tried that after I realized all of Mormon’s life, and the end of his entire civilization, was written by him in about 10 pages (I used to know the exact number, but I don’t anymore, and I don’t have a physical copy handy right now). Nephi had a lot more room, but he still had to cut out almost everything and abbreviate the rest. The fact that his account was graven on metal plates suggests to me that there were probably many, many parchment rewrites before it was etched down. I’d be interested in hearing more about why you’re sold on the kingship narrative that has been pushed by scholars lately. I have personally never been persuaded by it, although I haven’t heard all of its justifications. Since this is your personal dialogue with Nephi, scholarship must have been pretty persuasive for you to incorporate it. @mirrorrorrim RE rewrites, have you ever been struck by how often it seems like the BOM authors realize they wrote something wrong and then try repeatedly to backtrack without being able to erase what they already wrote? Like maybe they were working on the second side of a plate and erasing would have messed up the other side. That’s one of the little practical witnesses I notice in the text as a professional writer. Furthermore, I don’t know about this notion of racial prejudice being less today than in times past, at least on an aggregate human scale. Early Muslim and Christian missionaries promoted their religious beliefs to people of all different races and built multi-racial civilizations. Brad L, Nephi was coming from a culture where any non-Israelite was an ungodly heathen, which may have been heightened by recent super-nationalism in Jerusalem. So in that sense, Nephi may have considered whatever he thought light skin was (I’m one of those who tends to believe it had nothing to do with race, and everything to do with long-term exposure to son. That view to me ties in better with how often Mormon and the other writers make note of how little clothing the Lamanites wear. I honestly would not be surprised if there was even a modesty and covenant-rationalized component to the Nephite discrimination, not unfamiliar to what exists in the Church today. 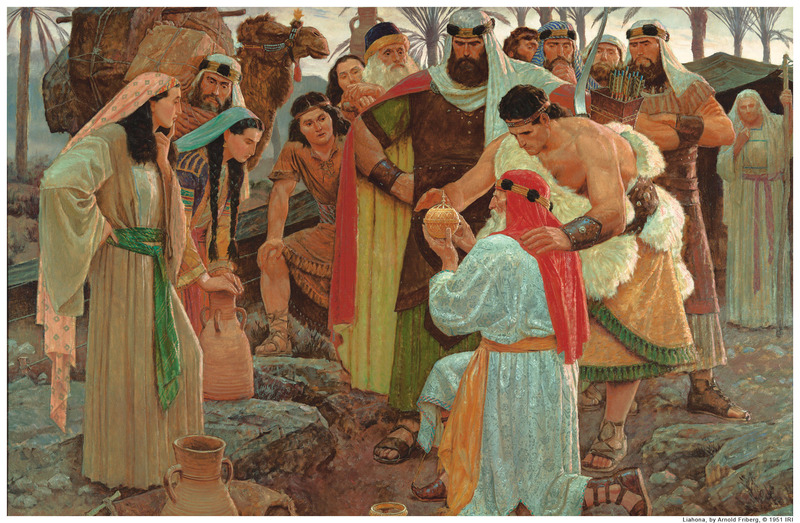 The Torah prescribed very particular components of clothing that Israel was supposed to wear, so for Nephi, the different dress the Lamanites adopted may well have been an indication of their abandonment of Israel’s covenant, like today if a Latter-day Saint sees someone else is obviously not still wearing their temple garments. Just my thoughts on it, though. Our taught theology from the First Presidency itself was explicitly racist well into the 1940s, and apostles vocally preached racism into the 1970s, so it certainly would not set a new precedent to have racially prejudicial prophets among the Nephites. *sun, not son. I don’t know why I never proofread my posts. Sorry. Brad, there’s no doubt egalitarian movements. But typically within those movements in-group/out-group cognitive judgements still are common. A great example is Islam which is extremely egalitarian in theory but in practice racial/tribal animosities still rage. Look at Afghanistan or even the Sunni/Shia divide. So individuals can preach egalitarian but the larger social environment plus the cognitive tendencies of human beings still dominate. As you note, in his way, Nephi is egalitarian. It’s just that he’s making judgments of the Laminates based upon external signs – possibly exaggerating those signs at the same time. I’d say that very early on you therefore have a fairly xenophobic relationship. I should add that it’s interesting comparing the Nephite/Lamanite in-group/out-group distinction to the Samaritan vs. Israel distinction. Especially as the Jews attempt to come back from exile. It’s also important to note that the idea of a curse of darkness is hardly unique to the Book of Mormon and can be found in early Judaism. This then gets taken up by early Islam which despite Muhammad’s more egalitarian racial teachings tend to see africans along these lines and justifying slavery. Horribly racist of course and not much different from what southerners in the US espoused to try and justify their slavery. I should note that by early Judaism I’m still talking about the talmudic era and not the era of Nephi. So we find the idea in the Genesis Rabba and the Pseudo-Philo. It’s fair to critique this as a context for Nephi. My point is just that these ideas are hardly unique to the 19th century. Of course they are horrible, but even otherwise good people do horrible things in the cultures of the past. I’m trying to understand Nephi as best as I can without speculation about the historical context in which Nephi supposedly emerged. In other words, I’m trying to explain Nephi as best as I can from the text of the Book of Mormon and in a way that wouldn’t be skewed by presuppositions about Nephi being fictional or real. I’m also not trying to justify Nephi, nor do I think that we should. In fairness, divine cursing was a mainstream of Israelite thought, particular in connection to violation of the covenant, the state of Laman and Lemuel. See my old post here. The “skin of blackness” aspect is an innovation in one sense, not so much in some others, but regardless, it may be that Nephi simply interpreted everything that happens post 2-Nephi-4 separation as part of the divine cursing. Clark, indeed in-group/out-group cognitive judgments along all sorts of different lines are simply part of human nature. Yet, again, some cognitive judgments are simply more charitable than others, some perceptions of the in-group/collective self are more inclusive, and some perceptions of the out-group/collective other are more reasonable (i.e., in-groups determined along the lines of merit or whether someone is drug free or not). And this isn’t bound by time and space, for there have been in the past a great number of societies who were collectively less judgmental along lines of race, ethnicity, physical features, etc. A side note on Islam: slave-holding in early Islam was vastly different from slave-holding in the 18th-19th century American south, both in theory and in practice. This short encyclopedia entry explains slavery in Islam really well. Under classical Islamic law, the only lawful slaves were those born to lawfully enslaved parents and those captured during a jihad conquest. Classical shari’a law forbade the enslavement of other Muslims, although it didn’t guarantee immediate manumission if a slave converted to Islam. The law further permitted slaves and free people to intermarry. Many of the military slaves taken prisoner by Muslims during the middle ages rose to positions of vast military and political power (the Mamluks who ruled Egypt during the Middle Ages were originally military slaves). Although there are many moral faults of Islam and Islamic civilization, racial segregation and discrimination can’t be numbered among them. This harks back to my original point that the post-civil rights West is not the only non-racist (relatively speaking in terms of ideals and perceptions of reality) society. There have been many before. Nephi’s position on race is not only somewhat harsh by today’s Western moral standards, but by those of many societies across time and space. You are right, however, that the early Jews/Hebrews were quite xenophobic and racist and that the Samaritans/Israel and Lamanite/Nephite distinctions are similar. I’m very much enjoying the discussion. I hope it doesn’t come as a disappointment, however, that currently my series doesn’t extend beyond I Nephi, so we’ll not have the opportunity to jump into these questions as a direct theme in a post. Maybe I’ll change my mind, however, and keep going. We’ll see when we get there. It seems the basic move humans can make to change in-group/out-group dynamics is simply to make more expansively the in-group. That’s what Nephi effectively does. I actually think the whole “children of Abraham” while appearing to be pushing in-group is expansive in that everyone gets brought into the Abrahamic covenant either via marriage or adoption. That element is, I think, part of the Book of Mormon even ignoring the whole question of whether Lamanites and Nephites mixed in with indigenous peoples. Again even when some cultures don’t make judgments based upon “race” (which is itself fairly socially defined) typically there are markers quickly queued into that mark in-group and out-group dynamics. And human cognition frankly tends to demote in value the Other. Personally I still think we should hesitate to call Nephi’s designations racial. I’m far from convinced these aren’t non-racial marks – especially tribal markings – rather than lining up with say American racism towards Asians, Africans or Indigenous Americans. I think that we tend to read the book through the lens of 19th century Americanism. While there are obviously reasons to do so I also think that we should question these readings to see if perhaps we’re not imposing on the text. There’s definitely a Lamanite/Nephite divide. But I think the relationship is much more complex than it first appears as I’ve said before. Especially early on. When Nephi first mentions the skin of blackness it’s only 30 years since they left Jerusalem and he’s likely just hitting his 50’s. While we can ascribe a miracle curse I suspect we should look for more naturalistic causes first. Especially given the passage I mentioned which definitely don’t seem like Nephi’s ascribing a miracle but rather a natural consequence of their apostasy from Israel. When referencing Nephi or the role of “Nephi” as a king, I have wondered about the population size of the civilization where it would be necessary to want to have a king or ruler in the way described when the family is desirous for him to be their king and the continuation of using Nephi as a title of sorts for the reign of kings. I do realize I carry my own baggage on the definition regarding “king”, but it strikes me as unusual given that the population as presented is quite limited with a split family of only 2-3 generations at that point. Also, one thing in the past that has helped with hearing/seeing the personality of Nephi has been listening to the reading of the first two books over the course of a shorter amount of time. Hearing the autobiographical narrative of 1 Nephi spoken aloud in a session or two can really give a flavor of how he is presenting himself, also the decline in the amount of lattitude he is willing give his brothers (and others) over the course of the book. It is probably the nature of my children’s relationship with each other, but when reading 1 Nephi 18:9-10 it almost comes across as Nephi pushing some hot buttons with his brethren when he approaches them about their “rudeness”. Similar to how my children often will point out they were not at all at fault and they were just trying to nicely say something, Nephi cites that he spoke “…to them with much soberness”. It’s them the overraction to this that then is represented as what causes the problems. I have wondered at times what the narrative might haev been if Nephi did not confront his brothers at that time. But I get ahead since we are only at I, Nephi. To add, I think you have a point about Islam, although also think that in practice it was more complex from what I’ve read of late antiquity and early medieval Islam. But I’ll be the first to admit it’s not an area I know much about. However most things I read distinguish between what was formally required versus what was already practice in the countries in question. Typically after conversion to Islam many practices continued. Further during say the conquest of Iran a lot of women were sold into slavery. So while the rules and economics of slavery were definitely different in Islam than the 19th century US South, I’m not sure it’s necessarily that much better. Slavery is horrific period. In any case my point was less about slavery which doesn’t really appear to be much an issue in the Book of Mormon (Mosiah 7 seems main place) than just racial dynamics. Even after slavery ended there was gross inequity in the United States related to race. Not just for African descendants but also Asians and others. I wouldn’t know what else to call them. Tribal markings seems too speculative. He seemed to literally believe that some persons’ (namely his brothers’ and their children’s) skin got darker because they became wicked and that it would become lighter when they repented. Nonetheless, I’ll cut Nephi some slack, since it is clear from his writings that he would accept darker-skinned people as equals if they agreed with his religious views. So this isn’t a racism as bad as that in the American south in which racist whites would never accept blacks as equals no matter their religious beliefs. Given that Nephi was writing for people in Joseph Smith’s day, it is within reason to judge him according to the standards of 19th century east-coast America. Compared with the hardened racism of American slaveholders of the time, Nephi’s views on race were more enlightened. On Islam, there have been and continue to be a many reprehensible forms of slavery existing with Islamic civilization, but nothing exactly like the race-based slavery in 18th-19th century America. Brad L, thank you for helping me understand where you are coming from. That’s actually a really interesting approach, and one I had never considered before. For me, first it was assume Nephi was infallible, then I jumped straight to understanding Nephi in the context of what I perceived to be his culture. I never thought to take him on his own terms. I’ll be interested to read the conclusions you derive from that approach. With that approach, I have to agree racism is the most natural reading of Nephi’s words about skin cursing. I find it interesting, looking at it that way, that Nephi’s idea of “curse,” seems to be very different than the norm. As you mentioned, he specifically says all are equal to God, and I would even remove the qualifer about having to agree to his religious views: the invitation of grace God provides, in my reading, is offered before any action on the part of the recipient. It’s almost like he is saying that people may be cursed to the world, but to God they are all one. But by extension, it is their acceptance of God’s grace that allows them to feel their oneness with the rest of humanity. Another interesting component of Nephi’s curse theology is that it is the opposite of standard racist theology. In effect, the curse is a sign that the Lamanites won’t be judged as harshly, because of the incorrect teachings of their parents, as the Nephites will. Using modern terms, it is a kind of benevolent racism, which is still troubling and problematic, but not nearly to the level of more modern “fence-sitter” doctrine, which has thankfully been, for the most part, abandoned. As much as I hate to say it, since I despise prejudice in all its forms, I can see the benefits of this approach. By saying an out-group is judged less harshly than the in-group, you potentially discourage the prejudices, judgments, and exclusion that naturally form against such groups. The Book of Mormon is pretty universal in saying that the Nephites, as long as they were righteous, were deeply invested in reconciling with the separate Lamanites. Enos’s conversion account, while originating on his own forgiveness, ends with a focus on helping the Lamanites receive forgiveness, so that desire in essence is the conclusion of his story. In many ways, its effects seem to parallel the modern desire by Latter-day Saints and certain other Christians to bring “fallen” Israel to reconciliation with Christ. I’ll have to think more about this, because I don’t like the conclusion I’m currently coming to. He wasn’t, actually. The Book of Mormon was edited for our day by Mormon and Moroni, 1000 years later. Nephi , by contrast, does not know why he has been commanded to write(1Ne 9:5) and so was wrote for his own people. Nephi crafts his writings as a religious and political apology, and they’re put to that use in missionary work to convince the Lamanites of the “wicked traditions” of their fathers about being wronged by Nephi so many times. Once that cultural stumbling block is gone, they convert en masse. So no, Nephi, to the extent he had an agenda, an audience, was one that was largely contemporary with him. Ben, true, Nephi was not conscious that he writing for people in Joseph Smith’s day. But a good portion of his words appear to be the Lord channeling divine words through him which are clearly intended for people in Joseph Smith’s day, since they wouldn’t appear to make any sense to his contemporaries (i.e., 2 Nephi 29:3, “A Bible, a Bible! We have got a Bible….”). Read 1 Nephi 12-13, 2 Nephi 33. Nephi knew us and wrote for us. It appears that his record was written over many years and at the end he knew his audience. This to me is quite profound. Good point, Rob. 2 Nephi 33:13: “my beloved brethren, all those who are of the house of Israel, and all ye ends of the earth, I speak unto you as the voice of one crying from the dust” indicates that Nephi’s intended audience is future generations who survive well beyond his mortal existence. We don’t know how vague Nephi’s (or Mormon’s or Moroni’s) knowledge of the future was. I do think they are writing for the future and not the 19th century or to a certain extent even us today. (Many of the things he writes for the future apply to us of course since we’re part of the process getting there) I think in particular Christ in 3 Nephi makes very clear that a lot of the message is for the descendants of the Laminates although to a certain extent all of us gentiles (loosely speaking) who’ve accepted the gospel. Certainly the warnings to us are quite pronounced although clearly as a people broadly speaking we’ll not listen and screw up. Then the promises Christ makes will come to pass. That said it’s also fair to ask about the translation process. I tend to think the translation is a loose translation. So, for instance, I think the KJV is clearly use to translate text that may not match that text exactly. (For example the many NT quotes in the pre-Christian part of the BoM) I also think it likely the case that inspired expansions were made to the text such that if we ever get the gold plates we’ll find that our text includes commentary on the signs on the plates. Finally we shouldn’t forget we have but a small part of the Book of Mormon translated. The large plates of Nephi roughly covering the era from Jerusalem to King Benjamin was lost by Martin Harris. (Or more exactly his wife) Then there’s the sealed part of the Book of Mormon that has yet to be revealed. We don’t know how much that is but acquaintances of Joseph give the amount as ½ to ? of the plates. In other words the vast majority of the Book of Mormon isn’t for our times at all because we don’t even have it! Lamanites not laminates. Silly auto correct. I just cannot read 1 Nephi as a narrative justifying Nephi’s coronation as a king. To the contrary, the first story in 1 Nephi seems to be expressly making the point that it is right for an individual to reject society, with both Lehi and Nephi decisively abandoning the physical surroundings and spiritual rituals and tenets of Israel in their quest to follow God. While I do not think we should oversimplify the reasons why 1 and 2 Nephi were written, contrary to establishing Nephi as king, it in part could explain why it was right for the people with Nephi to separate from the larger society led by Laman. As opposed to supporting societal authority, it is decidedly anti-. And I will fortify this land against all other nations. And he that fighteth against Zion shall perish, saith God. Just because Nephi’s account in part leads to a position in opposition to Laman’s right to rule does not mean it also seeks to uphold Nephi’s, although I can see why some would assume that. Nephi seems to be focused on rejecting traditional society, not building a new one. Rejecting the power of someone else does not necessarily mean you are trying to justify your own power. Nephi seems to be suggesting we reject all authority, both secular and spiritual, in order to follow God’s authority. That teaching is no solid foundation for promoting a new monarchy. I think those who see Nephi as a zealot are thinking more in terms of parallels with Paul in the NT. Likewise focus on Kingship is more about who leads the community. The split is between the lamanites and then the group among the Nephites (and likely indigenous groups they merged with) who Jacob criticizes so heavily. It’s not enough to just say what is right but one also has to have a founding story justifying the authority of ones group. The problem with seeing 1 Nephi in terms of that though is it’s not at all clear it’s a public text. I rather doubt it is. If, as some have suggested, it’s a text primarily read by a priestly class (if at all) then the political analysis breaks down somewhat. Only somewhat since Nephi even if it’s not a political text may still be writing through the later perspective of these more political matters. Mirror, a few thoughts (not that I’m a scholar). We think Nephi is writing this account as an old man in the city of Nephi, not as a “daily journal” along the way. 2 Ne 5:28-30 can (should?) be read to say that Nephi made the small plates 30 years after they left Jerusalem. It may have taken Nephi 10 years to write the initial account (see verse 34). They were already having wars with the Lamanites. We get occasional glimpse of the Lamanite view, which in short is that Nephi stole the rights of government away from Laman and Lemuel and/or they never should have left Jerusalem in the first place (see, e.g. the statement of Lamoni’s father in which he labels Nephites as the children of liar, or better yet Alma 54:17 in which Ammoron plainly states that Captain Moroni’s “fathers” robbed their brethren of the right of government). I think it’s not much of a leap to go from there to conclude that at least one of the points of several of Nephi’s stories is to show that God did in fact select Nephi to rule, he didn’t steal anything from Laman/Lemuel, instead it was the older brothers who rebelled, etc? I’m not sure I see any parallels with Paul in what James wrote. He seems to be referring to Nephi as a zealot because he sees Nephi as having a zealous devotion to the idea that he is the rightful heir of Lehi’s vision, unless I am missing something. I don’t know that Paul ever exhibited a single-mindedness equivalent to what James is suggesting. Nephi specifically says 1-2 Nephi are religious texts, not secular ones. So it pretty explicitly is saying it is NOT a political text. So if Nephi is wrong or deceptive in that declaration, I think there is a very high burden of proof on scholars to show that. I do not think that burden has been met. To the contrary, the first story in 1 Nephi, comprising chapters 1-5, is almost anarchistic in nature, but specifically religiously so. It is all about Lehi breaking Israel’s ritual laws, and Nephi breaking the Ten Commandments. Both actions are presented as the way each person follows God and does what is right. So even if scholars could prove it was a political text (which, like I said, I believe they can’t), it clearly seems to be an anarchist one, and not in any way one specifically supporting Nephi’s position as king. 1 Nephi could just as easily be used to support a rebellion against Nephi or Benjamin as one against Laman. David Day, I am aware it was written much later. Nephi is explicit in stating that in the text. Nephi also clearly believes he was right to break away from Laman, so of course the text will reflect that opinion. I acknowledge that. However, the text itself is directly stated to be a religious one, whose core message is a rejection of societal authority, both religious and secular, in order to follow God’s authority. Because of that, I see no support for the idea that 1-2 Nephi is a political text supporting Nephi’s position as king. To use a modern analogy, I believe women and men are equal. Because of that, anything I write will reflect that attitude. That does not mean, however, that everything I write is a feminist tract. In the same way, just because Nephi believed he was right to break away from Laman does not make 1-2 Nephi a political document supporting his kingship. If you’ve read N T Wright’s work on Paul then the parallels are much more pronounced. This is a bit anachronistic as the pharasee zealots were in a context quite unlike Jerusalem at the time of Nephi. But there are some parallels one can see. Whether one buys that context is an other matter. But it seems quite believable that Nephi was more in line with Jeremiah and were political activists who would have been seen as zealots by the reigning powers much like the Romans saw the more zealous pharisees. So it’s somewhat speculative but really not that controversial that I can see. Now reading too much Paul into Lehi/Nephi is a bit more dangerous. But I think Jeremiah as zealot (which really isn’t controversial at all) fits right in. Your final point I’m more sympathetic to. I think James has intentionally been a bit hyperbolic to get a reaction. I don’t think he thinks 1 Nephi is primarily a political tract but that it has this political function that is a major theme. Of course I shouldn’t put words in his mouth. I haven’t read Wright’s book. Also, the term “Zealot” seems a little confusing in that context, since the Zealots were an actual contemporary group of political radicals quite distinct from Pharisees. If James was referencing that work, I was unaware of it. I would be interested in learning more about Wright’s parallels, but I don’t know if this is the place for it or not. But feel free to educate me, if you think it applies! I think the Jeremiah association is closer, but even there, Nephi and Lehi depart from society in a way Jeremiah never did. Perhaps if Jeremiah hadn’t been imprisoned, he also would have abandoned Jerusalem, but that seems rather speculative. In my blog post (accessable by clicking on my name), I go into detail on how Lehi’s sacrifice directly violates various parts of the Hebrew Bible, specifically the Pentateuch, 1 Samuel, and 1-2 Kings but it seems like you’re talking about an extra-biblical tradition that would have been contemporary to Lehi. I have to admit I am entirely unfamiliar with scholarship on such traditions, although I would love to learn more, and would be grateful if you could fill me in on some of the basics. Are these inferences based on the mention in the Hebrew Bible of heterodox practices like worship in high places and groves, which I am familiar with, or are there actual other sources giving details about them? Setting all of that aside for a moment (hopefully not for too long, though—I really am interested in learning more), in my post I point out that Lehi’s second offering of sacrifice, which happens in 1 Nephi 5, is directly connected to him immediately thereafter searching the brass plates that Nephi recovered, which are directly stated to contain the five books of Moses (along with a history, which I am assuming would be at least similar to 1-2 Samuel and 1-2 Kings). Are you positing that the books mentioned are different than our current Pentateuch? I know some scholars believe the current Pentateuch to be largely a creation during the Exile and possibly even after. Is that the position you take? And if so, do you believe whatever older proto-Pentateuch Lehi possessed did not contain the same strict priesthood order, or the story of Korah, that the modern one does? If that’s your position, that does seem completely reasonable to me. But I would be interested in seeing your views spelled out in more detail, and what has led you to believe them. Briefly, on the Ten Commandments, I do not believe Nephi’s murder of Laban would have passed most societal measures of almost any society, and certainly not of the Jerusalem society of his day, especially with it being coupled with stealing the brass plates record as it was. Nephi states as much in his justification for forcibly conscripting Laban’s slave into joining them in the wilderness. This is definitely an interesting conversation for me. Yes, while some claimed Paul was part of the formal Zealots most people are using it more loosely. I’m not really talking extra biblical traditions but noting the common scholarly view that there wasn’t a single Judaism but differing Judaisms in tension – especially after the exile when the canon was being developed. Those who reject the documentary hypothesis or variants on it obviously won’t find it compelling. While lots of Mormons reject the DH a surprising number of apologists accept it with caveats as do many Mormon scholars. Once you buy into the view of differing groups each with their own views then the traditions make more sense. There’s still some issues to work out. One big problem is most scholars date most of these texts to the exile. So the assumption is that whatever texts were had pre-exile (and contemporary with Lehi) would have been quite unlike our current Bible with some exceptions (such as portions of Isaiah depending upon the scholarly tradition). Compare this with Nephi’s vision in 1 Ne 13:28-9;14:23. Part of the problem for apologists is explaining Nephi and Josiah’s reforms. Josiah appears to be centralizing the cult more and getting rid of local altars and the like. Also as I said the relationship between Jeremiah and Josiah seems complex at best and problematic at worse. Since Lehi is in the Jeremiah camp and appears to not accept the cultic centralization tying him too close to the Deutoronomists seems problematic IMO. On the other hand some have noted parallels between Sherem and Deutoronomist arguments in Jacob 5. As to my view, I think all of these views are based upon fairly weak evidence. So I’m not too committed to them. I am very persuaded by the view there was a higher and lower priesthood in Israel and that the Sons of Moses were this higher priesthood and that most records of this were destroyed during or after the exile. Sorry accidentally hit enter before I was ready. No edit function so I’ll just say that apologists see both pro and anti deuteronomist strains in the BoM. I’m not sure how to figure this out. Most are anti obviously since D tends to see revelation as done. But it’s not clear to me what’s going on. Thanks for the info, Clark. I read the Barker article and the Wikipedia entry on Deuteronomists, as well as some other online resources. I’m afraid I have to agree with you that these views are all based on rather weak evidence. They seem like a lot of New Testament textual criticism, which I am more familiar with, where scholars speak with an enormous amount of confidence based on a very small amount of inconclusive evidence. One other thing that I dislike about Biblical textual criticism is that, even for Christian authors, it excludes the possibility of genuine prophecy. For example, from all the research I have done, it seems all dating of the synoptic gospels is tied to the assumption that Jesus’s prophecies about the destruction of the temple could not have been written before the temple was actually destroyed. Dating of many other books is clearly based on the same thing. As a believer in the reality of prophecy, I find my beliefs are not even compatible with textual criticism’s most basic assumption. It’s interesting that Nephi considers Moses to be such a central figure, referring to his story multiple times for inspiration. From what I read, it seems like anti-Josiah-ists, if they really existed, tended to minimize Moses’s role. Nephi clearly does not. I guess what it comes down to is, I either have to accept that Nephi and Lehi’s canon on the brass plates was similar to the Hebrew Bible, or that it was drastically different in ways that are impossible to know with any degree of confidence. Honestly, it’s hard for me to take one side or the other. I love the Hebrew Bible, and can honestly say study of it has strengthened my testimony of Jesus Christ and The Church of Jesus Christ of Latter-day Saints more than any other book, The Book of Mormon included. I firmly believe most of it is inspired and contains great truth, and, due to its sheer size, much more truth than any other book of scripture. On the other hand, I find non-canonical scriptures incredibly interesting and compelling, and have no doubt that there are many more books of ancient scripture waiting to be discovered. And Nephi’s scriptural Messiah tradition clearly includes important sources absent in our Hebrew Bible. Many people have mentioned how the Law of Moses is seldom emphasized in The Book of Mormon, and most have attributed it to Mormon’s post-Law editorializing, but maybe the truth is that the Law was not as important in Nephi’s tradition, or was different in form. Maybe when prophets in The Book of Mormon, including Nephi, refer to the Law of Moses, it is different than the Law we now have. As tempting as it is to take a decided stance one way or the other, I find I really can’t. But that leaves me with either making no assumptions about Nephi’s scriptures, or making assumptions based on the Hebrew Bible we do have. The first one leaves me with nothing to say, so I’ll continue to go with the latter, acknowledging that some or all of my assumptions may potentially be incorrect, which I’ve been happy to admit anyway. So the first story in 1 Nephi MAY be an account of Lehi disobeying Israel’s ritual laws, and Nephi disobeying the Ten Commandments. Either way, it still has an anarchistic message that seems incompatible with the purpose of upholding his divinely-ordained kingship, which James suggested his purpose as being. Nephi clearly seems to hate the ideas of kings or any ultimate authority other than God, and considers them at best a sometimes-necessary evil. His first story is about God justifying killing and stealing, which, Law of Moses or no, are clearly disruptive of ordered society. His last message is focused on getting the Holy Ghost, which will thereafter direct the reader in all things she or he should do. He is unwilling to give even his own scripture ultimate authority, deferring to the Holy Ghost to the very end. The OT involves far less evidence than the NT IMO. I do agree that a problem is the exclusion of prophesy as possible although in some cases the issue is less prophesy than it is assumptions in the way prophesy is given. (Thinking here of the arguments over deutero-Isaiah) In those cases though one could postulate an older document edited to fit the new view of the exile. That said there are many scholars making these arguments who embrace prophesy so we can’t use the easy escape of them making a naturalistic fallacy. mirrorrorrim, Your comment about the lack of Law of Moses emphasis in the Book of Mormon is something I speculate on. I believe the Law WAS important in Nephi’s tradition, but because of editing AND assumptions of basic experience, its not dwelt on. Note that those who come into strong criticism are those who teach the Law of Moses AND say that its the Law that saves. That was a big Deuteronomist criticism that Barker has (although see my comment on another post). One theme I see in the Book of Mormon is that those who truly followed the Law of Moses were what we would call “Christian” although I agree with Clark’s analysis elsewhere that term has difficulties. Those who didn’t, but claimed to (i.e. Sherem and Priests of Noah) were anti-Christ. It has been fascinating to me the lack of attention to Moses in some of the Dead Sea Scrolls and also the Pseudepigrapha. Moses’ place in Judaism is central, but the non-canonical works don’t include him as much. That’s also a topic for further thought. Love the discussion. Very interesting. Mirror, thanks for sharing you blog link. You’ve probably figured out that I misunderstood your question (45) in that I assumed it was much more simple than it really was and I therefore gave an inappropriately simple reply. I’ve learned a lot from the subsequent discussion. I still feel like there are more political overtones in the 1-2 Nephi than you see there, but I certainly understand why you are taking the view you do. Terry, I think a good question is what the law meant. I think it fair to say in the DH split each had a very different conception of the law. It seems pretty clear for Nephi it means something different from say post-diaspora rabbinical Judaism. No worries, David Day. While I don’t believe 1-2 Nephi is political in nature, I can see why a lot of people do. The fact is, Nephi DOES mention Laman and Lemuel a lot, emphasizing the mistakes they make, and there has to be a reason for this. Right now, while I am convinced it is not to promote Nephi’s right to rule, I do not have another motivation to substitute in its place, although I am hoping to by the time I finish studying 1-2 Nephi this time around. At first I thought it might just be because of how much Nephi cares about them, and how heartbroken he was over the eventual split, but that seems insufficient. I do believe Nephi loved them deeply, but surely no more than his wife or children, and he never mentions any of the latter by name or spends much time on them, so there must be something more. I’d be interested to know if anyone here has alternative ideas she or he has considered beyond the political ones for why Nephi focuses so much on Laman and Lemuel. I believe Nephi has a unified theme throughout 1-2 Nephi, a big part of which is following the Spirit no matter what, which is what he starts and finished his narrative with. It is interesting to me that there is a clear break between 1 Nephi-2 Nephi 5, which contains a lot of history, and 2 Nephi 6-33, which contains essentially no history, besides the historical portions contained in Isaiah. Because of the clear separation, I am interested to know whether the two parts were composed simultaneously or sequentially—did Nephi tell all the history he wanted, then switch to sermons and scripture quotations, or was he constructing both at the same time? Also, why end the history where he does? The narrative does not end with Nephi leaving Laman’s group. Instead, he goes on for most of a chapter, giving a general history of the new society he built, including unusually specific information about the creation of swords. The final historical account Nephi relates is an account of his decision to create the record of 1-2 Nephi. After that, he just briefly mentions that another decade passed, and that his people had wars with Laman’s, giving no details whatsoever. The culmination of the history, then, appears to be the creation of the plates, which he clearly considers to have a distinct significance from the other secular plates. In a way, then, perhaps Nephi’s journey from 1 Nephi 1 through 2 Nephi 5 is not one about becoming king, but one about his path to the point where he is finally able to write the book of scripture we are reading. It is, if you will, a sample template for the journey a person takes to become a prophet. If that idea is correct, then it goes well with the anarchism Nephi promotes in his first story: he is acknowledging he has become a prophet, but is giving a template so every other person can become a prophet, too, exactly the same as he is. In addition to his own, he gives examples from both Jacob’s and Isaiah’s prophecies, too. But with all that said, I’m still not sure how the focus on Laman and Lemuel fits into that kind of plan. Except, maybe, that I have always wondered why 1 Nephi 7 is included, since it just seems to repeat, in less detail, a lot of the same things that happened in 1 Nephi 1-5. However it DOES uniquely include Nephi chastising his brothers about how they have free choice, and that if they really want to return to Jerusalem, they should just do so. Most ancient societies, including Israel, had strong concepts of communal spiritual interdependence. This was probably the biggest factor that led to Roman persecution of Christians, and the Hebrew Bible is also full of stories of the sins of a few bringing judgment on the many, such as Numbers 25, where Phinehas stops a plague from God by killing two people who had been committing sin. With Nephi’s focus on individual spirituality, and a one-on-one relationship with God’s Spirit, perhaps Laman and Lemuel are there to show that, when someone breaks God’s commandments, it does NOT cause the entire society to suffer, so there is no need to kill the person, or to otherwise communally atone for their actions. Laman curses himself and his own posterity, but Nephi is unhurt. This would have been a radical notion for the time, but one that seems an essential precursor to the kind of spirituality Nephi is promoting, where people are free to break societal spiritual laws when God commands them without fear of reprisal. Interesting thoughts Mirror (59). I’ve noticed the same “break” after 2 Ne 5 that you have noticed. My own personal speculation is that they were composed sequentially, but with one or more long “breaks” in between composition “periods”. Something along the lines of Nephi writing most of 1 Nephi and 2 Nephi through chapter 5 (and if I had been the one who first organized the BoM into chapters and verses I would have started 2 Ne with what we now call chapter 6), then Nephi took a “break” to fight a war, work on the large plates, do other stuff, and the next time that he spend substantive time on the small plates he felt like/was impressed to start going a different direction. I’ve wondered when Jacob gave the various sermons in chapters 6-10 (which I think is 3 separate sermons given on 3 different occasions, but it’s hard to tell) and how much later it was when Nephi wrote them and why he choose these specific sermons (other than that they are really good, especially chapter 9). It’s also interesting that we get none of Nephi’s own sermons to his people, we instead get Jacob’s sermons, then lots of Isaiah, and then words from Nephi to us (but not to his own people). Humility on Nephi’s part? Maybe he just felt like Jacob was a better public speaker? Are these Jacob’s best overall sermons, or the ones most relevant for our day? David. I think Jacob’s sermons are more in line with his role as the High Priest over the people. The sermons may have been involved with some kind of ritual (like the annual Yom Kippur celebration). I seem to remember William Hamblin presenting on this subject at one of the Temple conferences in Utah in 2012 and 2013. It was not included in the published articles but the video is here: http://www.mormoninterpreter.com/william-hamblin-on-jacobs-sermon-2-nephi-6-10-and-the-day-of-atonement. I also seem to remember reading about such sermons in Daniel Stokl Ben Ezra’s Impact of Yom Kippur on Early Christianity (Mohr Siebeck, 2003). Nephi was over the secular arm and Jacob was the High Priest. I don’t think it had anything to do with Nephi’s humility (which I don’t think he would view in the same context we do anyway). The division of the Kingship and High Priest office is something for another time, but my impression is that the King Mosiahs and Benjamin functioned in both of those offices (or at least were over them). That is certainly NOT a Second Temple element. Mosiah II divided the offices and perhaps it was something that Nephi and Jacob had between them that the Nephites went away from until Mosiah restored the difference. Of course, he was also the last king in a kind of reverse to what happened in Israel and Judah. Interesting Terry. I’ll check out the Interpreter piece. I apparently need to re-read 2 Nephi. I was aware of the King (Protector)/High Priest distinction (I tend to say Temple/Palace) but I had always assumed that Nephi filled both roles and at/near the end of his life he made Jacob the HP (I had assumed that Jacob was essentially the #2 Priest) and someone else (presumably a son) the “King”. You seem to be saying that Nephi instead gave the HP role to Jacob much earlier (or perhaps never held it at all). Is that correct? What clues point you in that direction? (I ask with some hesitation since there’s some possibility that there is a verse that clearly states this that I’ve just missed). Can I put in a plug for Legal Cases in the Book of Mormon (MI). Welch speculates that the Sherem/Jacob encounter is a temple palace conflict with Sherem the designated palace spokesman sent to deal with Jacob. Further speculation that Jacob’s sermon on concubines et al. had not gone over well at the palace. David, I think it could easily have been the way you say. Nephi (even as king) would have overseen the ministry and appointed the High Priest. My interpretation is admittedly speculative. I think that’s a topic for more close reading, particularly since Nephi’s emphasis is “his reign and ministry” which goes very “ministry” in 2 Nephi. If Jacob’s talks were from the Yom Kippur temple celebrations, then they would have been something Nephi would have been likely to record. I highly recommend Legal Cases in the Book of Mormon as well. The analysis for the Sherem/Jacob conflict, or the Jacob/Yom Kippur sermons is similar to the Benjamin/Feast of Tabernacles. The idea behind there being a High Priest sermon as part of Yom Kippur is not set in concrete. From a logical standpoint it makes sense, but my 21st century logic doesn’t always apply to these matters. A question that intrigues me more, is where Jacob got the “authority” to be the High Priest. I’m not sure where the Levites or the line of Aaron is in all this. I suspect that’s where the Melchizedek analysis spoken of by Alma comes in. Again, I refer to Josh G. Mathews’ book, “Melchizedek’s Alternative Priesthood Order” (Eisenbraun’s 2013) for an interesting theory that the Aaronic Priesthood was subordinate to Melchizedek and that Moses got the Melchizedek Priesthood from Jethro. I’ve been looking at the Melchizedek material that’s come out since Jack Welch’s 1990 article in By Study and Also By Faith (FARMS/Deseret Book, 1990) available at the MI website. There’s quite a bit and the younger scholars like Mathews are exploring new realms about Melchizedek and his priesthood. (Sorry James to be getting a bit off the 1 Nephi track). Terry H, from the text, it seems pretty clear that Nephi was the top authority over secular AND religious matters. In Jacob 1, Jacob makes clear that Nephi is still giving him spiritual commandments even after he hands over the plates, which appears to be shortly before Nephi’s death. In 2 Nephi 6, Jacob also specifically references the fact that he is speaking on a topic that was assigned to him by Nephi. “And now I, Nephi, write more of the words of Isaiah, for my soul delighteth in his words. For I will liken his words unto my people, and I will send them forth unto all my children, for he verily saw my Redeemer, even as I have seen him. Nephi clearly states that he is including the words of both Isaiah and Nephi because they have had visions of the same Redeemer Nephi has had visions about. Not because Jacob became High Priest over spiritual matters while Nephi was over secular ones, but because he was a second witness. Again, Nephi seems, by my reading, to adhere very closely to the ideas in our modern Pentateuch, specifically here about having multiple witnesses of things. So I don’t know if it is direct humility, but it does at least demonstrate Nephi’s willingness to not be the sole voice of authority for his people. That also seems to be why Nephi chose the particular parts of sermons that he did In 2 Nephi 11, Nephi specifically states that the foregoing sermon by Jacob was longer than what Nephi chose to include. So, whatever the original reason for giving the sermon, whether it was a religious holiday or not, Nephi was not just recording it for its own and history’s sake. Finally, a bit about authority. In 2 Nephi 5, Nephi says that he is the one who consecrated Jacob and Joseph as priests. I think we want the priesthood in The Book of Mormon to match up with something we would recognize a modern equivalency for, with lines of authority, etc., in a way that imposes something entirely foreign to the text itself. Through the end of Mosiah’s life, it seems pretty clear that the Nephites function on a patriarchal order of priesthood, with the king serving as patriarch, and appointing whomever he wants to the priesthood, with the king serving as ultimate head of the church. This is a system common in many ancient societies, including Christianity once it was embraced by the Roman Empire. Jacob received his authority from Nephi, because Nephi was the king. Alma I received his authority from Noah, because he was the king. And so on. I find no hint in The Book of Mormon to encourage a reading of either a traditional Israelite priesthood based on lineage or a modern Latter-day Saint Melchizedek order with particular lines of authority. I can find absolutely zero evidence that Nephites cared about such things. The closest example is with Limhi’s people and baptism, but that seems to be more about Limhi feeling that Noah, due to his wickedness, had lost his right of patriarchal rule, tied closely to the sentiments Limhi expressed in Mosiah 7 about the people reaping the poison of their own chaff which they have thrown into the wind, and also seems to be why Limhi was so quick to give up his kingship after uniting with the people of Mosiah. When prophets did arise outside of the patriarchal system, like Abinadi, they seem to have been uniquely called by God, and, like Lehi, felt free to disregard established ritualistic laws. Proper authority is a Doctrine and Covenants concept, not one from The Book of Mormon, at least as far as I can tell. Maybe you have seen some things I have missed. Sorry, 4th paragraph, *Isaiah and Jacob, not Isaiah and Nephi. I really need to proofread better before I post. Sorry for the triple post. David Day, starting in 1 Nephi 19, it seems like we do get at least one public sermon from Nephi given to his brothers. But yes, it is interesting that we don’t get any explicitly public sermons from Nephi after he broke apart from Laman. Also, while the way chapter headings are arranged makes this hard to tell (the newest edition of the scriptures is better, since it removes the italics from headings that are part of the original scriptural text), it seems that the division between 1 Nephi and 2 Nephi was one made by the original author, not by Joseph Smith or a later Latter-day Saint editor. 2 Nephi begins with the same kind of Nephi-written summary that 1 Nephi started with. The summary, “An account of the death of Lehi. Nephi’s brethren rebel against him. The Lord warns Nephi to depart into the wilderness. His journeyings in the wilderness, and so forth,” is part of the original text, not a scholarly chapter heading. That, to me, makes it an even stranger place for there to be a division. It almost seems like, at first, Nephi was planning on having. Interestingly, though, the historical narrative of 1 Nephi ends with Nephi making the large, more secular plates, after which it switches to Nephi’s sermon, just as 2 Nephi’s historical narrative ends with Nephi making the second set of more spiritual plates, then switches over to sermons and scripture quotations. I’m not sure entirely what to make of that, though. Perhaps for 1 Nephi, Nephi is taking the most relevant parts from the large plates, while 2 Nephi is entirely new, distinct material? If so, that would make sense why the division between books seems so arbitrary. Sorry—4th paragraph: *planning on having a lot more history, but then made the decision to focus on sermons instead. Mirrormirroim (59) I’d be interested to know if anyone here has alternative ideas she or he has considered beyond the political ones for why Nephi focuses so much on Laman and Lemuel. Mirrorrorrim (64) I suspect we’re seeing in Nephi a remnant of the more patriarchal (in the Bendoin sense not feminist sense) structure with him assuming de facto place in the family after Laman and Lemuel leave and Lehi dies. This would be in addition to his place as King. But I agree it’s a bit odd the relationship between Jacob and Nephi. Nephi is much more hopeful about the new land too whereas I get the feeling Jacob sees it all as a disaster of a sort. Basically they escape Jerusalem and then repeat its problems. I also think Nephi turns to making midrash on Isaiah because again he sees everything as repetition of archetypes. To him Isaiah + Exodus is everything. I’d note that the repetitious nature of his merkabah ties into this. To him it’s the same vision as his father (albeit with angelic commentary) and part of it is him being told John will get the same vision. So I think his midrashic expansions are important. Mirrorrorrim (64) Finally, a bit about authority. In 2 Nephi 5, Nephi says that he is the one who consecrated Jacob and Joseph as priests. I think we want the priesthood in The Book of Mormon to match up with something we would recognize a modern equivalency for, with lines of authority, etc., in a way that imposes something entirely foreign to the text itself. One thing to keep in mind is how later merkabah texts that parallel Nephi’s often involve bestowal of authority (and often meeting Enoch, Elijah or Moses). While I doubt that’s Nephi’s claim to authority (which I think comes from a still surviving school of prophets in Jerusalem) it’s an other possibility. Mirrorrorrim (64) Through the end of Mosiah’s life, it seems pretty clear that the Nephites function on a patriarchal order of priesthood, with the king serving as patriarch, and appointing whomever he wants to the priesthood, with the king serving as ultimate head of the church. I’m far from convinced of this. There are a lot of interesting gaps in the text just where one wishes there were information. For instance where did Abinadi come from? How about Samuel the Lamanite? The common approach is to assume they are wandering figures arising just with inspiration and a charismatic preaching power, as most take Jeremiah and company to be. I suspect there’s more to it. Certainly it’s odd how Alma returns to the Nephite homeland and becomes head of the church. Likewise that whole bit I keep referring to in Alma 11-14 suggests much more structure than we get described. I bet there is a lot more we just don’t know about. Mirrorrorrim (64) Proper authority is a Doctrine and Covenants concept, not one from The Book of Mormon, at least as far as I can tell. Maybe you have seen some things I have missed. I think the D&C makes things more complex than you suggest. First D&C 46 offers a non-hierarchal amount of power. As a practical way this is power in an odd fashion. Second as I’ve noted D&C 84 has that odd Sons of Aaron and Moses bit that parallels some scholarly theories about pre-exilic authority (and conflicts). Third, there does appear to be elements of hierarchy at times – if only following in some odd ways the levitical practices. (Perhaps without sons of Aaron among the Nephites) The whole way the law of Moses was followed remains a big mystery in the Book of Mormon. We have elements of course (the priests Alma was a part of under Noah for instance) and then hints of practice (theory that Benjamin’s address was a Sukkot or feast of the tabernacles). Admittedly we don’t have conflict over who was ordained by whom. (Unlike say places where Paul tells various cities to be on guard of false teachers pretending to have authority in the NT) This may be due to the Book of Mormon frankly taking place among a much smaller population and region. None of this is to deny that the Nephites would have transformed whatever traditions they had. And as we’ve noted, it’s completely unclear exactly what kind of Judaism they practiced even in Israel. Lots of speculation among scholars about what pre-exilic Judaism was like. Whatever there was would have been transformed in America. But I like the idea of Nephi seeing everything as cyclical archetypes. Mormon does the same thing, so it makes some sense that it goes all the way back to Nephi. That may be part of why Mormon liked what he saw on the small plates so much that he decided to add them to his record. About authority, I agree it gets more complicated after Mosiah dies. But even once Alma becomes the “head” of the church, it is pretty clear he still submits to Mosiah as the ultimate authority, such as when he goes to him first about what to do to admonish people who have committed serious sins. Even the source of Alma’s authority is clear, directly stated in Mosiah 26: “Now king Mosiah had given Alma the authority over the church.” So it’s not odd that he becomes a leader in the church: Mosiah, the patriarch, anointed him to become such. After Mosiah’s death, Alma starts out with the same patriarchal system, but based on judges, not kings. When Alma decides to give up the judgment seat, though, he changes things, by not also giving up priesthood rule, creating the first separation of secular rule and religious rule. As for Samuel the Lamanite, it seems pretty clear that most Nephites, even righteous ones, DIDN’T value him the same as Nephite prophets, which is why Jesus had to specifically command them to include the fulfillment of Samuel’s prophecies in their record. I’ll need to read over Alma 11-14 again, but every time I have read it, I have not seen it as being focused on priesthood authority, like others have. It is all about Jesus Christ, and relating His role to the role of priests that the people were already familiar with, paralleling what the author of Hebrews did. However, it may point to Lehi’s justification for breaking the ritual law: he may have felt he was a Melchizedek priest. Or it is very possible that rationalization was added much later. Regardless, as we have already seen, Alma’s authority has been explicitly stated in-text to come from Mosiah. The fact that most people point to Alma 13 when talking about priesthood line of authority shows just how absent the concept is from The Book of Mormon. I also agree the subject is more complicated in The Doctrine and Covenants, and is not necessarily consistent throughout. I think there’s a reason church lessons focus on just a couple of sections when emphasizing the importance of priesthood lines of authority, because only a few sections are all that concerned about it. But I think those couple of sections do state the concept pretty explicitly, unlike The Book of Mormon, which doesn’t. Sorry to disagree. Also, for me, saying the narrative does not give enough information is the same as saying something is not present in the book. It is clear that as long as there were kings among the Nephites, the kings ordained the priests, even when, like with Zeniff’s people, branches of Nephites broke off and formed new societies. It is clear prophets existed outside of this structure, like Abinadi, but it is also clear that the main society did not accept their authority (Abinadi was burned for heresy). Those who did accept them, like Alma, did so based on the power of their words and testimony, not on being convinced they were the rightful heirs to some line of authority. And even Alma, after accepting Abinadi as prophet, still later accepted Mosiah as the source of his authority in the church. To me, this seems to parallel the structure that seems present in the Hebrew Bible and the pre-Resurrection New Testament—there is an acknowledged priesthood authority, but prophets exist outside that line, and the head of the priesthood oversees ordinances, not doctrines, and may become corrupt over time. That’s the doctrine The Book of Mormon teaches, but we understandably tend to ignore it, since it would be a threat to our modern order. Imagine what would happen if someone said that the Quorum of the Twelve could be wrong, and that a true prophet could arise from anywhere? But that is the kind of system of revelation The Book of Mormon teaches: one that comes from God, not from societal structures, and which can transcend society when necessary. The Hebrew Bible and New Testament are second and third witnesses to The Book of Mormon’s system. As is even The Doctrine and Covenants, which, as you suggested, is more complicated than we tend to portray it, as seen, for example, by the structure of common consent, where the members are given the obligation to reject anything that comes from their leaders that does not come from God.